Sometimes I make notes to myself early on in the writing stage and then totally forget about them when it comes time to do the art. In this case, I had originally noted to design the Cove asteroids to look very different from the previous asteroids of the Gamelon Cluster. Basically, it was important for me that in any future establishing shots of either location, readers could immediately tell one from the other based solely on the look of the asteroids. Dang. No biggie though. In the future, I’ll probably just tweak the Cove asteroids to have more visible piping and small bits of tech on the surface to differentiate them. So I am making a note to self now. We’ll see if I remember it this time! Kinda makes sense they’d just look more asteroids. Visible piping and bits of tech on the surface would garner interest from anyone passing through the system. Not something you want for a secret hideout. Ah ha! 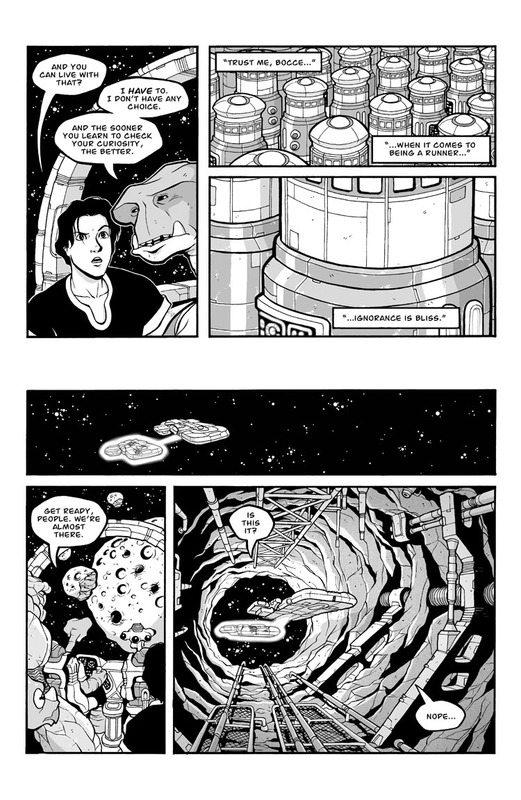 But as will be revealed in the next page (which is actually a double spread, so I hope it posts okay), the original use for the asteroids is a bit different from what it’s being used as now. So the exterior piping and tech would make a little more sense. Ooohhh….suspense!